The new generation quick-set-up multifuel expedition stove. In extreme conditions, where reliability and simplicity in use are safety issues,its at its best. The outdoor adventurer who wants less weight and stuff size, but the best in cooking performance, will appreciate the new design and features of the NOVA. Voluntary Recall announced by Consumer Products Safety Commission. Description: This recall involves Optimus Nova and Nova+ camping stoves and equipment, including the stove's fuel pump and spare parts/repair kits. The stoves are black metal, measure about 6 inches in diameter and 3½ inches high and can be used with multiple types of fuel. Stove serial numbers QA000011 through QA007313 are included in this recall. The serial number and "Optimus" are printed on the side of the camping stove. Pumps and spare parts kits also were sold separately. Pumps have a green open/close valve. Spare parts kits model numbers include 80163051, 8520, 80176321 and 8511 and are printed on the packaging. The Nova is much less noisy than the MSR DragonFly stove. As many have written about the DragonFly (sounds like a jet engine), the Nova is still noisy when cranked open. But not nearly so as the MSR DragonFly. I bought the stove, two fuel bottles and a repair kit. I used coleman fuel only. I had it out camping twice and boiled water each time, but it was always stopped up, and never worked right. I decided to put the new tip, from the repair kit in it, but the old tip was stuck. While trying to remove it I damaged the stove. It really never worked right even once. This is one of those products which one expects so much of, but is a pricy lump of junk. How does it get such good reviews, and win awards? Stay away from this one. Of all the camping gear I have purchased, this is the most disapointing. I would not spend any additional money here. When your had, you are had. Coleman Multifuel Stove - I've owned two and there good. Owning a Whisperlite I wanted a stove which would simmer as the selection of backpacking foods available at grocery stores has become quite good. I settled on the Optimus Nova having looked it over at the store, it had a leather pump cup as well as all metal construction. When the stove works, it really works well. But it has one fatal design flaw which renders it virtually worthless once you use it a few times. The O-Ring in the quick coupler is only good for about 10 uses before it shreds. This happened on day 3 of the border route trail. I lit up the stove as it started leaking fuel and the fuel leak caught on fire. I could not put it out and it burned for a few minutes before I could douse it with water. The stove was ruined. Likes: It's light and simmer fairly well. The pot stand is a perfect size and it doesn't slip and slide. Update: The stove has been recalled for this exact problem. According to Katadyn there is a machining problem which causes it to shred the o-ring in the coupler and leak fuel. So there you go. I'm going to give it 2 stars until the problem is resolved. I don't want to bash this stove because with the problem of the coupler solved, it really is quite capable. I used this stove 10 times. It was leaking little gas from the quick coupler. It cought on fire. Than the nightmare started. Getting the parts for that stove is hell. They did not have parts here in USA. Main store in Swetzerland kept me waiting for 4 months. I am not kidding. They asked me to pay 58 dollars for a pump and 12 dollars for a hose. 70 dollars. Stay away from this brand. I will never buy any equipment without having the parts available in USA. Veyr bad customer service. Horrible. 4 months after 20 e mails (no exeggeration) and 8 phone calls to switzerland still didnt get any result. They said that they will charge 80 dollars for a fuel pump and a hose. You figure out. I used coleman multifuel and dualfuel. Both are similar with this product in heat produced and quality. Difference is you can buy coleman parts anywhere and a decent price. Optimus nova parts will kill you. It will cost more than a full build stove. type of stove is not recommended as an only stove for someone new to using white gas/multifuel pump em up stoves. My original MSR XGK lasted almost thirty years with only one factory rebuild. It had an all metal pump body like the Nova. The new XGKs have lots of plastic in the pump and I've heard of many problems. I bought one and returned it. The Nova simmers beautifully the MSR XGK did not. Other MSR stoves simmer okay but they don't perform as well as the XGK and Nova in extreme conditions. Unless MSR brings back the older more durable pumps, I'll stick with the Nova. So far very impressed with this stove. I've had to problem solve a few times, but have never been totally let down by a gas stove. When I get a new stove I tear it down and put it back together several times along with numerous practice primes, cooking and various fuels then I'll take it out and really put it to use. If you know how it works you can fix almost any problem with this type of stove but you have to remember the tools and maintenance kit. I once ran out of fuel on a kayak trip and with some trouble was able to run the Nova with our last pint of vegetable oil we brought for frying the fish we never caught. The built in jet cleaner had to be used every few minutes when output dropped but it WORKED! I love being able to flip the bottle so the fuel and pressure can be bled off so the line is almost dry when you disconect and it doesn't drip and stink like my MSR stoves. Its not a design flaw as some have noted! If you aren't aware of how this feature works I can see the trouble some have had. Hint: The bottle has to be level and flipped to the off position. This puts the fuel pickup tube in the air pocket inside the fuel bottle and you MUST run it with the valve OPEN until it runs dry and then remember to shut the valve before moving and disconnecting the fuel line. The burner primes easily with about half a teaspoon of fuel and is at full output faster than my XGK. It doesn't seem to transmit as much heat downward compared to the MSR stoves so its less trouble when set up on snow. You still need something under it or it will sink. 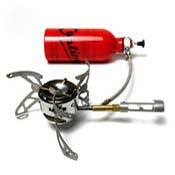 The burner folds easily and is solidly built for the long haul. If I bring a canister stove for ease of use in mild weather, I usually bring the Nova for backup. By the way if the magic magnet isn't handy you can shake it like the shaker jet stoves. Keep the matches or lighter handy as it often goes out with this method. If pumping doesn't work when output falls, the jet is starting to clog. If you learn how to remove the jet and assure that the weighted cleaning wire is actually able to move freely to clean the jet you will be able to deal with the most common problem I have encountered. If you are careful to run clean white gas or kerosene this will rarely be necessary. Another tip, keep the end of the fuel line and the pump port covered. Mine came with a cap for the pump port. The right size pen cap works for the fuel line. Cap carefully and immediately lest you forget and get some troublesome crud in there. This is easy to overlook and probably causes most of the filter clogging troubles I've heard about. I don't get overly excited about boil times. This baby always gets water boiling quickly even in subzero temps. and that is a crucial requirement for some of my trips. I may take it to slightly over 21,000 feet next trip to Nepal. Will update my impressions afterwards. It won't be the only stove on the trip so those of you that have doubts about it can relax. Will try to use aviation fuel. The local kerosene and petrol can be quite contaminated. It boiled 1 quart of ice-cold Duluth tapwater (covered pan) in 4 minutes flat to a rolling boil. I shut it down and filled the fuel bottle with exactly 14 ounces of white gas and put her on full max, and it burned for 1 hour and 18 minutes. I've never timed my Coleman Peak1, but I don't think it comes close to that. The Coleman holds a little less fuel, but not by much. And the swing-out pan stands have a larger width than the Peak1 for more stability. It puts the pot or pan lower to the ground by a short mile than the Peak1, which is nice. Even if you did drop a pot off of it, it probably wouldn't tip all the way over and make dirt the added spice to a needed meal. My only complaint is that it is difficult to dial down for a low simmer without the flame going out. It goes to about medium to maybe medium-low before getting sketchy. But it was not designed for simmering. It is meant to get hot and get hot fast. That just means that if you are heating up a block of frozen beef stew, you better attend it the whole time and stir well. I purchased this stove at an REI used gear sale and the only thing wrong with it was that the previous owner did not oil the leather cup in the pump... fool! I have used it several times now with no problems. This was one of the best deals I have ever found at a used gear sale. I like that it has an aluminum pump and all metal construction compared with the MSR that I used to use. I really want to love this stove. I've had it for 6 months now and have gone on a number of hiking trips with it. It simmers great--much better than any other stove that I've used. It's a great cooking stove, I have no complaints in that respect; in fact, I praise this stove for its design and usability, it really does work well. The problem is, the thing keeps breaking down on me! The first major trip I took with it was a 9 day trip on the Superior Hiking Trail. Three days into the trip, the stove started sputtering and losing a lot of heating power, so much that I couldn't even cook pasta. I ended up cooking over an open fire for the next three nights, then when I hooked up with a new hiking buddy we used his stove instead. When I got home, I looked at my schematic and discovered that my fuel filter had gotten clogged, perhaps with metal shavings from the new fuel bottle. I replaced the filter and didn't worry about it anymore. This didn't seem like a big deal, but the manual doesn't even mention cleaing the filter. Well, I just got back from a one-night winter trip today, and my stove broke down again. As I was getting ready to cook dinner last night, I hooked up my fuel bottle, pressurized it, then moved the bottle a bit. The nozzle on the end of the fuel line broke off, leaving it in the fuel bottle, which sprayed fuel all over. Luckily, I hadn't lit the stove yet or I would have had a raging fireball! Note that this is not the problem that some people have, when they disconnect a pressurized tank--this is a manufacturing defect, a very dangerous one. I'm getting this stove warranteed, but I will not hike without a backup for a long time. Like I said before, I really, really want to like this stove, want it to work, cause it cooks so well when it's working! I purchased the stove (new) from Highland Gear on eBay. Their customer service has been great, fast emails and very willing to warantee my stove. I was a little hesitant about dropping $130 on this stove, but it has proved to be well worth the cost. It is very sturdy, very compact, the flame control is very precise, and it has no plastic parts. (This was appealing to me because plastic parts on a stove seem like a silly notion)The pouch it comes with to store it in has a strap so you can attach it to the outside of your pack for easy access.